It is my great pleasure to launch the first OECD Business and Finance Outlook, and to open a high-level roundtable with such distinguished panellists, including Governors Knot and Visco, Larry Zimpleman of Principal Financial Group, and some great market experts. I would like to thank Adrian and his team for their work in putting together this publication and today’s event. 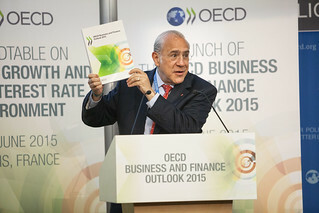 24 June 2015 - OECD Secretary-General Angel Gurría speaking at the launch of the first edition of the OECD Business and Finance Outlook. When we launched the latest edition of the OECD Economic Outlook earlier this month, we awarded the global economy a ‘B minus’ grade. Nearly seven years after the crisis began, weak and hesitant global investment is preventing a vigorous and sustainable recovery from taking hold. In a sense, today’s ‘newborn’ Business and Finance Outlook is the twin sister of the Economic Outlook. It delves deeper into what we are calling the ‘global investment puzzle’, namely: at a time of easy money, why is there so little productive investment by firms in advanced countries? And, a related question: why do firms see so much risk while financial investors seem oblivious to the build-up of risks in the financial system? The long-term funding gap facing pension funds and life insurers. Strong growth in illiquid holdings – particularly in hedge funds and new alternative assets that use a lot of derivatives for hedging. A big rise in borrowing by emerging and frontier markets and issuance of high-yield corporate bonds. At the same time, we see a systematic decline in covenant protection for lenders who may be competing for yield now, but who may run into future problems. Increasing interdependence – regulatory reform has made banks safer, but financial institutions are more closely connected than ever. The world of so-called ‘shadow banking’ is increasingly interacting with pension funds and insurance companies. Paradoxically, corporations are sitting on trillions of dollars of liquidity because of what they perceive as an uncertain and risky economic environment or because of flawed tax regimes. What we need therefore is, on the one hand, more diverse sources of private financing for productive investment and, on the other hand, efforts to limit interconnectivity in the financial sector - by separating traditional deposit banking from more risky activities, for example. Cross-border investment patterns have become largely determined by the rise of global value chains – GVCs – which have led to a geographic divergence in investment as multinationals outsource investment from advanced to emerging economies. One possibility explored in the Outlook is that there may have been too much investment in less efficient locations, giving rise to excess capacity in parts of the global supply chain. But business surveys also show us that economic uncertainty is a major factor holding back real investment in advanced economies, where companies are favouring share buybacks and cross-border asset divestments. Nor does cash returned to shareholders appear to be finding its way into new productive investments. In fact, stock markets in advanced economies are punishing firms that invest: Over the 2009-2014 period buying shares in companies with low capex, while selling those with high capex, would have added 12% to the value of your portfolio in Japan, 21% in emerging countries, 47% in Europe, and a whopping 50% in the United States. Clearly, the incentives are badly skewed! At the same time, we see evidence of significant overinvestment in some big emerging markets where regulations, controls and dominant state-owned companies weaken market signals. The fact that investment per unit of sales in general industry has been running at double the rate in emerging markets than in advanced economies may indicate some of these inefficiencies. This has led to sales per employee in emerging market firms catching up with levels in advanced economies, without a similar convergence in value added per employee. This lag in convergence may be reinforced by multinationals pursuing operating efficiency and tax strategy over investment in R&D and innovation when making cross-border investments. Our Outlook suggests, moreover, that the investment pendulum may have swung too far in some cases. One striking finding is that the return on equity has fallen markedly in emerging market firms, below the cost of equity, on average, and even below the cost of debt in some cases. So, while net returns (ROE-COE) for general industry firms in our sample were safely above 10% in the US and Europe, they were close to zero in emerging markets. Clearly, past over-investment has opened up a ‘negative value creation gap’ for investors! We cannot undo mistakes of the past, but we can avoid making them in the future. This means levelling the playing field so that firms have equal access to demand in all countries, and so that capital can be allocated smoothly across borders, in line with the OECD Codes. But, we also need to continue improving framework conditions, and to improve policy certainty, using tools like the OECD’s updated Policy Framework for Investment, for example. The current low-growth, low-interest rate environment poses particular problems for pension funds and life insurers. These financial intermediaries, which offer long-term financial promises, rely on investment returns to honour their obligations. Today’s Business and Finance Outlook identifies significant funding gaps as annuity promises based on existing mortality tables show shortfalls in many countries, both from rising longevity risk and from lower interest rates. Increasingly, therefore, pension funds and life insurers are feeling the pressure to chase yield themselves, and to pursue higher-risk investment strategies that could ultimately undermine their solvency. This not only poses financial sector risks, but potentially jeopardises the secure retirement of our citizens. As pension funds and insurers allocate more capital to alternative assets, and increasingly interact with the shadow banking system, regulators and policy makers will need to remain vigilant. At the same time, promoting infrastructure and other long-term, productive investments by these institutions can help raise real returns on capital in advanced economies more generally, thereby improving structural conditions for business and the financial sector. A key premise of today’s Outlook is that business and finance are twin engines of growth – closely interlinked and global in scope. Ultimately, addressing the growth and investment challenge is not just about corporates and economic aggregates – it’s about people! It’s about kick-starting the economy so that it leads to the sustained improvements in living standards that our citizens crave, while allowing us to tackle underlying challenges like our warming planet and ageing societies. We still have a long way to travel to make financial markets work for people. There is still much to do to eliminate capital misallocation, to transcend the current under-pricing of risk and to strengthen the ability of the system to absorb future shocks. The OECD is proud to share in this task and work towards better business and finance policies for better lives. And now, over to our moderator, Mr. Axel Threlfall, Editor-at-large at Reuters, and long-standing friend of the OECD.